Bottega Michelangelo has undergone an unbelievabe transformation. 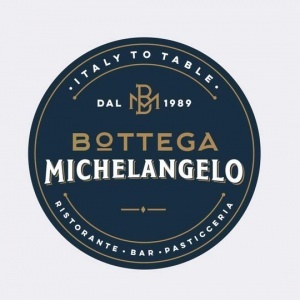 After an extensive renovation, Michelangos reopened in October 2017 as “Bottega Michelangelos”. This great Italian restaurant has been a mainstay in Tucson for 25 years. Bottega Michelangelo celebrated its silver anniversary in May 2014. The atmosphere at Bottega Michelangelo has changed from old world European charm to clean contemporary. The change in decor did not change the great food and service. The food is outstanding. From the fresh-baked rolls that have a lovely herbal taste to the selection of appetizers and main course offerings. The menu has simple items such as pizza to wonderful pastas and chicken dishes. One of the signature dishes is Chicken Grigliata. It is comprised of a tender cooked skinless boneless breast in a sauce of just the right amount of a champagne cream. Then it is topped with artichoke hearts. It is complemented with a Fettuccine alfredo on the side. Yummy! A main standby is the spaghettini with marinara sauce. And don’t forget to have the server give it that extra dusting of grated cheese at table. The happy hour deals at Bottega Michelangelo are one of the best kept secrets in Tucson. An happy hour menu that can be dinner. The house wine is good and only $3 a glass. I know! How can that be? The reno opened what was a small bar area into a large space. High top tables, additional bar seating and a 12+ person group table. So, if you come to the happy come early and stay late. And if the food isn’t enough, Bottega Michelangelo introduced a desert menu that will make anyone forget they are on a diet. Check out the desert case as you enter the restaurant. Visit Bottega Michelangelo Website for more information. For those interested in consistently great Italian food and pizza Bottega Michealangelo is the place in Oro Valley AZ. We are a top Realtor duo in Tucson, AZ since 2002. Read our client testimonials. Give us a call. We look forward to making your home buying or selling a home an enjoyable experience for YOU!If you are considering a move to Oro Valley Arizona or thinking of a great winter retreat? We can help.